Presentation at 3rd Tsunami Symposium of the Tsunami Society May 23-25, 2006, East-West Center, University of Hawaii, Honolulu, Hawaii. Although large earthquakes along the Makran Subduction Zone are infrequent, the potential for the generation of destructive tsunamis in the Northern Arabian Sea cannot be overlooked. It is quite possible that historical tsunamis in this region have not been properly reported or documented. Such past tsunamis must have affected Southern Pakistan, India, Iran, Oman, the Maldives and other countries bordering the Indian Ocean. The best known of the historical tsunamis in the region is the one generated by the great earthquake of November 28, 1945 off Pakistan's Makran Coast (Balochistan) in the Northern Arabian Sea. The destructive tsunami killed more than 4,000 people in Southern Pakistan but also caused great loss of life and devastation along the coasts of Western India, Iran, Oman and possibly elsewhere. 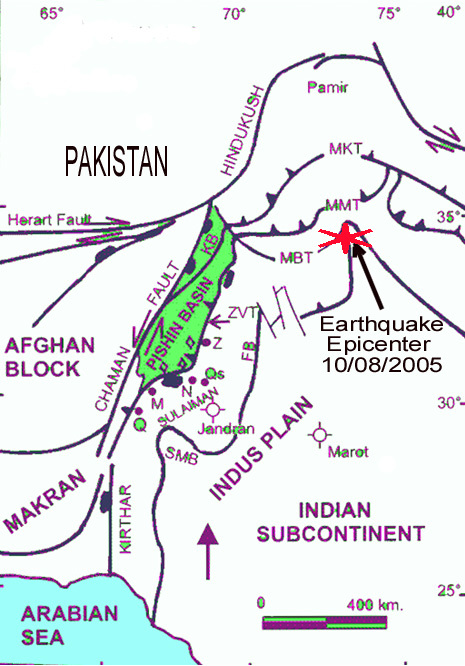 The seismotectonics of the Makran subduction zone, historical earthquakes in the region, the recent earthquake of October 8, 2005 in Northern Pakistan, and the great tsunamigenic earthquakes of December 26, 2004 and March 28, 2005, are indicative of the active tectonic collision process that is taking place along the entire southern and southeastern boundary of the Eurasian plate as it collides with the Indian plate and adjacent microplates. Tectonic stress transference to other, stress loaded tectonic regions could trigger tsunamigenic earthquakes in the Northern Arabian Sea in the future. The northward movement and subduction of the Oman oceanic lithosphere beneath the Iranian micro-plate at a very shallow angle and at the high rate is responsible for active orogenesis and uplift that has created a belt of highly folded and densely faulted coastal mountain ridges along the coastal region of Makran, in both the Balochistan and Sindh provinces. The same tectonic collision process has created offshore thrust faults. As in the past, large destructive tsunamigenic earthquakes can occur along major faults in the east Makran region, near Karachi, as well as along the western end of the subduction zone. In fact, recent seismic activity indicates that a large earthquake is possible in the region west of the 1945 event. Such an earthquake can be expected to generate a destructive tsunami. Additionally, the on-going subduction of the two micro-plates has dragged tertiary marine sediments into an accretionary prism - thus forming the Makran coastal region, Thick sediments, that have accumulated along the deltaic coastlines from the erosion of the Himalayas, particularly along the eastern Sindh region near the Indus River delta, have the potential to fail and cause large underwater tsunamigenic slides. Even smaller magnitude earthquakes could trigger such underwater landslides. Finally, an earthquake similar to that of 1945 in the Makran zone of subduction, has the potential of generating a bookshelf type of failure within the compacted sediments - as that associated with the "silent" and slow 1992 Nicaragua earthquake - thus contributing to a more destructive tsunami. In conclusion, the Makran subduction zone has a relatively high potential for large tsunamigenic earthquakes. Large earthquakes along the Makran Subduction Zone (MSZ) have generated destructive tsunamis in the past (Berninghausen, 1966). Although the historic record is incomplete, it is believed that tsunamis from this region had significant impact on several countries bordering the Northern Arabian Sea and the Indian Ocean. The tsunami generated along the MSZ on November 28, 1945 was responsible for great loss of life and destruction along the coasts of Pakistan, Iran, India and Oman (Qureshi, 2006; Pakistan Meteorological Department 2005; Mokhtari and Farahbod, 2005; Pararas-Carayannis, 2006a). The effects of this tsunami on other countries bordering the Indian Ocean have not been adequately documented. Reports on the potential for tsunami generation along the Makran coast of Pakistan have been cursory. Based on a thorough review of recent geophysical surveys and seismic data, the present study analyzes the potential tsunami generation mechanisms along the MSZ by reviewing subduction processes of the Oman oceanic lithosphere underneath the Iranian microplate and - more specifically - the seismotectonics of the east and west segments, including the section in the Gulf of Oman. Furthermore, the study examines the seismo-dynamics of compressional collision of the India and Eurasia plates along the northwestern boundary of India in the vicinity of the Northern Arabian Sea - as potential sources of future tsunamis and evaluates the tsunami risk from major earthquakes along coastal Karach, the deltaic Indus region and the grabens of Northwestern India. Finally, the study evaluates the possible effects of the extensive sedimentation from major rivers in the region on subduction processes. On November 28, 1945, an earthquake, off Pakistan's Makran Coast (Balochistan) generated a destructive tsunami in the Northern Arabian Sea and the Indian Ocean. More than 4,000 people were killed in Pakistan by both the combined effects of the earthquake and the tsunami. However, the tsunami was responsible for most of the loss of life and the great destruction, which occurred along the coasts of Iran, Oman and northwestern India (Pararas-Carayannis, 2006b). The great earthquake occurred at 21:56 UTC (03:26 IST), on 28 November 1945). Its epicenter was off the Makran coast at 24.5 N 63.0 E (24.2 N, 62.6 E according to USGS, in the northern Arabian Sea, about 100 km south of Karachi and about 87 kms SSW of Churi (Baluchistan), Pakistan. The quake's focal depth was 25 kms. The earthquake's Richter Magnitude (Ms) was 7.8. The Moment Magnitude (Mw) was later given as 7.9 and reevaluated to be 8.1 (Pacheco and L. Sykes, 1992). The quake was recorded by observatories in New Delhi, Kolkata (Calcutta) and Kodaikanal. Its intensity was high throughout the region. It was strongly felt in Baluchistan and the Las Bela area of Pakistan. It was reported that in the western and southern sections of Karachi the strong surface motions lasted for about 30 seconds. According to eyewitness reports, people were "thrown out of their beds", doors and windows rattled, and windowpanes broke. The underwater cable link between Karachi and Muscat (Oman) was damaged, disrupting communications. The lighthouse at Cape Moze - 45 miles from Karachi - was also damaged. The earthquake was strongly felt also at Manora, where the lighthouse was damaged. It was moderately felt in Panjgaur and Kanpur. The earthquake is reported to have caused the eruption of a mud volcano a few miles off the Makran Coast of Pakistan (Wadia, 1981). The eruption formed four small islands. A large volume of gas emitted at one of these islands, is reported to have sent flames "hundreds of meters" into the sky (Times of India 1945; Mathur, S.M. "Physical Geology of India). Such mud volcanoes are not uncommon in the Sindh region of the Makran coast. Their presence indicates the existence of high petroleum deposits. They are known to discharge flammable gases such as methane, ethane and traces of other hydrocarbons. The observed flames resulted from emitted natural gas which caught fire after the earthquake. Most of the earthquakes in this region of Southeast Asia occur mainly on land along the boundaries of the Indian tectonic plate and the Iranian and Afghan micro-plates. At least 28 earthquakes with magnitudes close to 7 or over 7 are known to have occurred in this region from 1668 to the present time (Ambrasseys and Bilham, 2003). According to historical records, in 893-894 A.D an earthquake with an estimated moment magnitude of 7.5 occurred in the Debal (lower Sindh) region of what is now Pakistan killing 150,000 people and destroying several towns. There is no data on whether it generated a tsunami. Also, historic records indicate that a large earthquake in late October/early November 325 BC generated a tsunamiwhich impacted the fleet of Alexander the Great, which was in the vicinity of the Indus river delta at that time (Pararas-Carayannis, 2006a). The large earthquake is believed to have ruptured almost the entire length of the MSZ's eastern segment. The length of its rupture is estimated at about 300-350 km. A major tsunami was generated which was destructive in Pakistan, India, Iran and Oman. The approximate location and size of the tsunami generating area is shown in Fig. 1 below. Fig. 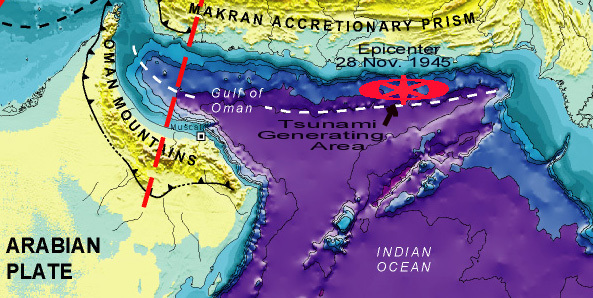 2 The generating area of the 28 November 1945 tsunami off the Makran coast of Pakistan. PAKISTAN - The tsunami reached a maximum run up height of 13 m (40 feet) along the Makran coast. The waves destroyed fishing villages and caused great damage to port facilities. More than 4,000 people died from the combined effects of the earthquake and the tsunami, but most deaths were caused by the tsunami. The tsunami destroyed completely Khudi, a fishing village about 30 miles west of Karachi, killing its entire people. At Dabo Creek, 12 fishermen were swept out to sea. Elsewhere along the Makran coast there was considerable destruction and loss of life. Many people died at the towns of Pasni and Ormara but no details are available. Many more were washed out to sea. At Pasni, the waves destroyed government buildings, rest houses and postal and telegraph facilities. The tsunami was recorded at Gwadar, but there is no report on damages. Karachi was struck by waves of about 2 m (6.5 feet) in height. According to reports the first wave was recorded at 5:30 am local time, then at 7:00am, 7:15am and finally at 8:15am. The last wave at 8:15 was the largest. The tsunami arrived from the direction of Clifton and Ghizri. There was no reported damage to the port and boats in the harbor of Karachi. However, at Keamari the waves flooded a couple of compounds along the harbor's oil installations. INDIA - Waves as high as 11.0 to 11.5 m struck the Kutch region of Gujarat, on the west coast of India, causing extensive destruction and loss of life. Eyewitnesses reported that the tsunami came in like a fast rising tide. The tsunami reached as far south as Mumbai, Bombay Harbor, Versova (Andheri), Haji Ali (Mahalaxmi), Juhu (Ville Parle) and Danda (Khar). According to reports the first wave was observed at 8:15am (local time) on Salsette Island in Mumbai. In Mumbai the height of the tsunami was 2 meters. Fifteen (15) persons were washed away. There was no report on damage at Bombay Harbor. Five people died at Versova (Andheri, Mumbai), and six more at Haji Ali (Mahalaxmi, Mumbai), Several fishing boats were torn off their moorings at Danda and Juhu. IRAN - The tsunami caused extensive flooding of low-lying areas but no details are available. OMAN - There was considerable loss of life and destruction but no details are available. The tsunami was recorded at Muscat. The active, subduction zone along the Makran coast of Pakistan and Iran has produced many tsunamigenic earthquakes in the Northern Arabian Sea in the past and is a potential source region for future destructive tsunamis. As demonstrated by the 1945 event, the region is capable of generating tsunamigenic earthquakes with moment magnitudes up to Mw 8.1. Also, large earthquakes along the Kutch Graben of India have caused major sea flooding and destruction of coastal areas. Extensive sedimentation by major rivers has created unstable continental slope conditions, so the potential of tsunami generation from such sources cannot be overlooked. Understanding the seismotectonics of the region and the subduction processes along the MSZ in particular, is useful in assessing future large/great earthquakes and tsunami hazards in the Indian Ocean. Migration of the Indian tectonic plate and collision with the Eurasian tectonic plate has developed a diffuse zone of deformation and seismicity in the entire South Asia region. Continuous compression due to continent-continent convergence along the Himalayan arc boundary has resulted in major thrust or reverse type of faulting which has caused upward displacement of the Indian plate, the formation of the Himalayan Mountain Range and the Tibetan Plateau. High compression and seismic activity characterize the entire tectonic boundary along both the eastern and western sections of the thrust. Continuing active collision along the northwestern boundary at the foothills of the Himalayan mountains caused the destructive October 8, 2005 earthquake in Pakistan (Pararas-Carayannis, 2005). The continental convergence has further deformed and folded the western boundary, creating fractured microplates, great faults, large grabens and a major subduction zone. A complicated pattern of tectonic micro-plates and areas of both subduction and upthrust characterize the region. 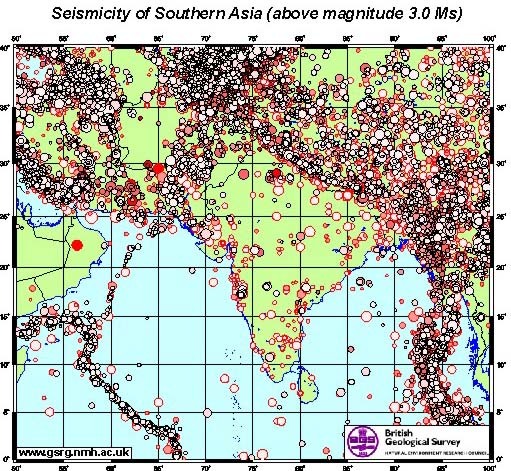 Complex, kinematic earth movements along the boundaries of such active zones have caused numerous destructive earthquakes in India, Pakistan, Afghanistan, Iran and Tibet in recent years. Earthquakes along the Makran Subduction Zone and in the Kutch Graben region of India are infrequent but have the potential of generating destructive tsunamis - some with far reaching impact. Fig. 4 British Geological Survey graphic of the seismicity of Southern Asia of the Carlsberg Midoceanic Ridge and of the southern portion of the Arabian Peninsula and the Red Sea. Active tectonic convergence of the India plate with the Arabian and Iranian microplates at a rate of about 30 to 50 mm/y (Platt et al. 1985) has created an extensive and complex tectonic plate margin in Southcentral Asia along the Makran coasts of Iran and Pakistan. The east-west oriented complex is one of the largest accretionary wedges on earth. It is more than 800 km long, bounded to the east and west by large transform faults which define the plate boundaries. The present front includes the Makran Subduction Zone (MSZ) and its associated topographic trench which, to a large extent, is buried by sediments. Also, the margin includes the Makran Accretionary Prism (MAP), the Makran Coastal Range (MCR) and the Chegai Volcanic Arc. To the west of the Accretionary Prism, continental collision has formed the Zagros fold and thrust belt (Regard et al., 2003). The Gulf of Oman and the Makran offshore region have been extensively surveyed over the years with swath mapping, high-resolution and single-channel reflection seismics, ocean-bottom seismology, micro-seismicity monitoring, magnetics, gravity and 2D seismic data collection (GEOMAR, Germany, the University of Cambridge and the National Institute of Oceanography, Pakistan, - Cruise (SONNE-123), 1997, 2000; Dorostian & Gheitanchi; Hutchinson et al 1981). Fig. 5 Distribution of earthquake epicenters along the boundaries of the Pakistan, Afghanistan, Iran and Arabian microplates. The Makran Subduction Zone (MSZ) in the Northern Arabian Sea has been formed by the northward movement of the Oman oceanic lithosphere and its under thrusting of the Iranian micro-plate at a very shallow angle of about 20 degrees. The east-west trending MSZ is more than 800-km-long. The trench associated with the present accretionary front does not have much of a morphological relief as other trenches around the world's oceans. A very thick sedimentary column enters the subduction zone (Closs et al., 1969, White and Louden, 1983). Extensive erosion of the Himalayan mountain ranges and the numerous rivers which flow into the North Arabian Sea have buried the trench with sediments with thickness of up to 7 km. The deeper structure of the MSZ, the wedge sediments and the subducted oceanic crust has been surveyed recently by wide-angle and seismic reflection (Kopp et al., 2000). The effects of this extensive sedimentation on the seismotectonics of the region and the potential tsunami generation will be examined in a subsequent section. The morphology of the coastal region is further complicated by the extreme sediment accretion from the erosion in the Himalayas (Closs et al., 1969, White and Louden, 1983; Platt et al., 1985; Minshull et al., 1992, Fruehn et al., 1997). The active tectonic convergence of the Oman oceanic lithosphere with the Iranian micro-plate has dragged thick tertiary marine sediments into a very extensive accretionary prism complex at the southern edge of the Asian continent (White and Louden, 1983; Platt et al., 1985). Studies of the morphotectonics of the MAP using swathmapping and 3.5 kHz Parasound echo sounding (Huhn et al., 1998) have provided a better assessment of the tectonic plate movements and interactions. The MAP complex is more than 900 km long and it is highly fractured. It has the same east-west orientation as the MSZ and is bounded on both sides by large transform faults associated with tectonic plate boundaries. The MAP is the largest of its kind in the world, with up to 7 km of sediments deposited in the Gulf of Oman to the west, and major rivers contributing vast amount of sediment to the offshore region in the east. Fig. 7. Tectonic compression along the Makran Accretionary Prism has formed an extensive orocline, The Makran Coastal Range in southern Pakistan. Along the Balochistan section of the Makran coast of Pakistan there is less sedimentation. Several small river deltas have been formed and the continental shelf of the Arabian Sea in this region measures only 15-40 km in width. However, in the eastern Sindh region, the Indus River has formed one of the largest deltas in the world. 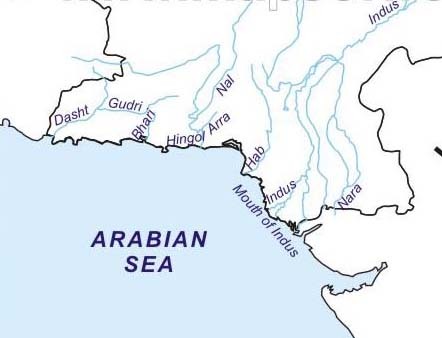 Past meandering of Indus have formed extensive deltas east of Karachi and have altered significantly ancient shorelines. In this region of the Northern Arabian Sea, extensive sedimentation has widened the continental shelf to about 150 km. The same active tectonic convergence of the Oman oceanic lithosphere beneath the Iranian micro-plate has lifted the tertiary marine sediments into a very extensive coastal mountain range at the southern edge of the Asian continent (White and Louden, 1983; Platt et al., 1985). The Makran Coastal Range (MCR) is a narrow belt of highly folded and densely faulted mountain ridges which parallel the present shoreline and extend for about 75 percent of the total coast length for about 800 km (500 mi) in both the Balochistan and Sindh Provinces. The steep mountains rise to an elevation of up to 1,500 m (5,000 ft). The coast is rugged with uplifted terraces, cliffs and headlands. The same tectonic mechanism has resulted in the formation of the Chagai volcanic arc, which extends into Iran on the west and truncates against the Chaman transform fault on the east. The Koh-e- Sultan volcano and other volcanic cones in the Chagai area are side products of this active subduction (Bakht, 2000; Schoppel, 1977). . Koh-e-Sultan was a formidable volcano once, but it hadn't erupted in 800 years. However, at the present time there is no evidence of very active volcanism - as along other tectonic convergence zones - and the Koh-e-Sultan volcano appears to be in a dormant stage. Even if volcanoes on the Chegai arc become active again, they are too far removed from the coast to pose any threat for tsunami generation. Fig. 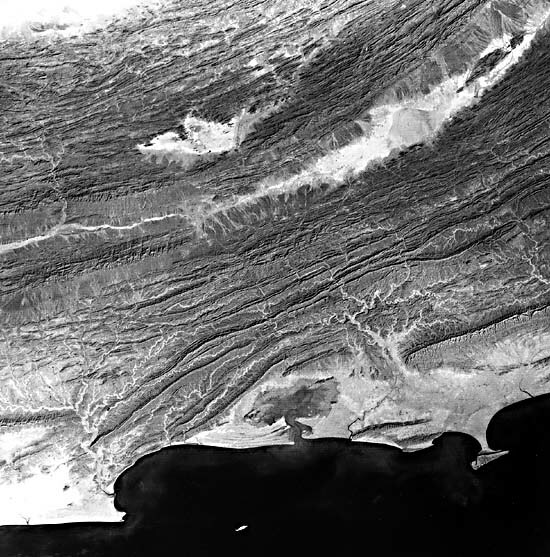 8 NASA Satellite photo of a section of the Makran rugged and tectonic coastline showing uplifted terraces, headlands, sandy beaches, mud flats, rocky cliffs, bays and deltas. Numerous mud volcanoes are present along the shores. 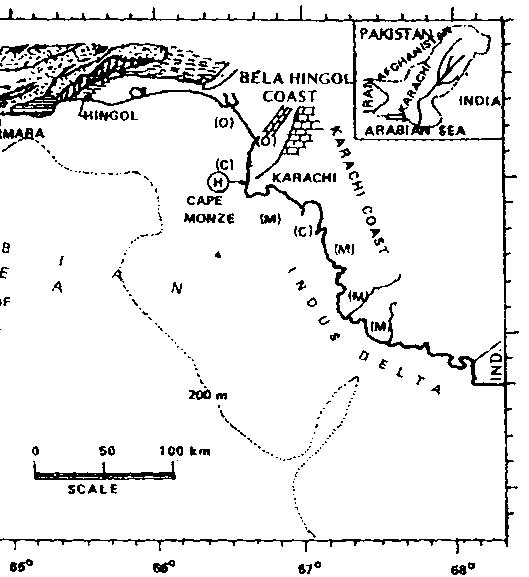 East of the Makran Accretionary Prism and the zone of tectonic subduction, lateral transition between subduction and collision of the India and Arabia tectonic plates at about 42mm/yr has formed the Kutch, Bombay, Cambay and Namacia Grabens, in northwestern India (Wadia, 1981). Although these grabens are not directly related to the Makran seismotectonics, they are included in this report because they are potential tsunami sources in the Northern Arabian Sea. These grabens are bounded by thrust and subsidence faults that are close to coastal regions, where significant earthquakes occurred in the past and will occur again in the future. The Kutch graben region has produced several large earthquakes - the latest in 2001 (Pararas-Carayannis, 2001). The seismo-dynamics of the Southcentral Eurasian plate's margin along the Makran coast are complex because of compressional collision of major and minor tectonic plates. The entire region is traversed by thrust and transform faults, formed by great tectonic stresses. Major and great earthquakes occur with frequency. The following review of major faults can help identify potential tsunamigenic sources in the region. Most of Pakistan's major faults are on land and most earthquakes occur in the north, the northwestern and the western sections of the country, along the boundary of the Indian tectonic plate with the Iranian and Afghan micro-plates (Quittmeyer and Jacob, 1979; Jadoon, 1992). Major inland thrust zones exist along the Kirthar, Sulaiman and Salt mountain ranges. The devastating October 8, 2005 Earthquake occurred in the Hazara-Kashmir syntaxial bend - the region of maximum collision in the north (Pararas-Carayannis, 2005). Fewer earthquakes occur along faults near the Makran Continental Margin. However, some of these earthquakes can be major or great in magnitude and some have the potential of generating tsunamis - either by the nature of their tectonic crustal movements or by the triggering of underwater landslides. Deformation along the entire length of the MSZ appears to be uniform - which indicates that the rate of subduction does not change appreciably from east to west. However there is a large change in seismicity, degree of deformation, as well as significant variations in rupture histories between the eastern and western MSZ (Minshull et al., 1992; Dorostian & Gheitanchi). Each region exhibits a different seismicity pattern. Also, recent geological studies indicate that two Paleozoic continental blocks dominate the overriding tectonic plate. The boundary between these two blocks is approximately coincident with the transition and the differences in seismicity between the eastern and western MSZ. Also, recent surveys of the Makra accretionary wedge using swathmapping and 3.5 kHz Parasound echo sounding (Huhn et al., 1998), indicate that a sinistral, strike-slip fault crosses the wedge obliquely and continues to the abyssal plain. The significance of these findings is that this fault separates the MSZ, into two different segments - the western which has very low seismicity, from the eastern where the seismicity is significantly higher. Also, this unique morphotectonic feature has led to the postulation that the north-easternmost part of the Arabian plate, is actually a separate micro plate that moves independently. Two recent shallow earthquakes in this central region exhibited right-lateral strike-slip motion, (Dorostian & Gheitanchi, Iran & Institute of Geophysics, Tehran Univ.) which also supports that there are two major segments to the MSZ - each behaving differently, but still capable of generating large tsunamigenic earthquakes. Therefore, the apparent variation in seismicity between the eastern and western segments of the MSZ may be due to differences in slip mechanisms of two different tectonic microplates. Eastern Segment: The length of the eastern MSZ segment is estimated at about 350-400 km. Most of the 14 known earthquakes have occurred along this segment. Of these, only the great (Mw 8.1) earthquake of 1945 was instrumentally recorded (Byrne et al. 1992). Also, there appears to be a pattern in seismic activity prior to major earthquakes on the eastern segment. Large earthquakes are preceded by increased activity of smaller events. For example, for ten years prior to the 1945 Makran earthquake, there was a concentration of seismic activity in the vicinity of its epicenter. Western Segment: The western segment of the MSZ has not generated any known tsunamigenic earthquakes. However, recent seismic activity indicates that a large earthquake is possible in the region west of the 1945 event. Such an earthquake could generate a destructive tsunami. Since the western segment is an extension of the eastern rupture of an active subduction zone in a region where major earthquakes have occurred recently in Iran, Afganistan and Pakistan, its relative seismic quietness over a long period is somewhat puzzling and posing several questions. Why has this region remained aseismic? Is the western segment locked and building stress for a great event in the future? Is it possible that the western segment is significantly different from the eastern and experiences largely aseismic slip at all times? Can an earthquake as great as the 1945 occur along the western segment? Is this segment of the MSZ a potential source of destructive tsunamis in the North Arabian Sea and the Indian Ocean? A review of the geophysical and geological processes and the findings of recent surveys on both segments of the MSZ can help answer some of these questions and help evaluate the potential for tsunami generation along the western region. Comparison of the Eastern and Western Segments: The seismodynamics of the western segment of the MSZ are complex. The presence of late Holocene marine terraces along sections of the coasts of both eastern and western Makran could be construed as proof that both segments of the arc are able to produce large plate boundary earthquakes. The absence of earthquakes along the plate boundary on the western segment indicates that either entirely aseismic subduction occurs or that the megathrust plate boundary is currently locked. Aseismic deformation has been inferred elsewhere along the north-south convergence between the plates of Arabia to the south and Eurasia to the north. For example, earthquake and geodetic data indicate greater aseismic deformation in the Zagros region in Southern Iran than that in the Alborz-Kopet-Dag regions of northern Iran, where deformation results primarily from earthquake activity (Masson et al., 2005). The implication from these findings is that aseismic subduction and deformation must also occur south of the Zagros fault along the western subduction boundary of the MSZ, in the Gulf of Oman. This could account for the lack or seismic activity on the western segment of the MSZ. Of course, this does not mean complete absence of earthquakes along thrust faults on the western segment of the MSZ and of the MAZ - only that aseismic deformation occurs most of the time. Occasional major earthquakes can be expected and these have the potential to generate tsunamis that could be particularly destructive in the Gulf of Oman. A better understanding of the complex processes of sediment transport and the effect of sedimentation on shear stresses and interactions along tectonic boundaries of subduction zones, can lead to improved evaluation of seismic and tsunami risks. Also, continental slope instability due to extensive sedimentation from major rivers in the region adds to the tsunamigenic potential from underwater landslides. Aside from tectonic stresses, sedimentation may be partly responsible for the observed differences in seismicity between the eastern and western segments of the MSZ. Therefore a comparison of the sedimentary structure of the eastern and western MSZ helps shed some light on how subduction processes may be affected and the potential for the generation of tsunamigenic earthquakes. As with other subduction zones, the aseismic region on the entire MSZ lies within that part of the accretionary wedge that consists of largely unconsolidated sediments with seismic velocities less than 4.0 km/s. This region in the overlying accretionary wedge remains aseismic during and between great earthquakes. Thus, the extensive forearc and accretionary wedge seem to have significant effects on the type of boundary slips that can be expected along the MSZ - and thus on the frequency and intensity of potential tsunamigenic earthquakes in the Northern Arabian Sea region. Fine turbidite deposits in the offshore region may affect the mechanics of subduction processes near the deformation boundary of the tectonic plates. As mentioned previously, the subducted oceanic crustal structure of the MSZ has been partially studied with seismic velocity models from four wide-angle seismic lines that image the wedge sediments and with collection of seismic reflection data (Kopp et al. 2000). The data indicates that fine turbidite sediments bypass the accretionary ridges and are transported to greater depths offshore and may be responsible for the sparse earthquake activity associated with subduction in different segments of the subduction zone. Such turbidite bypass occurs primarily in the western region. Essentially, these findings suggest that fine sediments are available to lubricate the western segment plate boundary sufficiently to allow slow slippage most of the time. Such mechanism could account for the suspected aseismic slip of the tectonic plates along the western segment. However, if the plate boundary is locked or partially locked, this would suggest that great earthquakes with long repeat times might be possible also along the western segment. Based on the present studies and surveys, it appears that both seismic and aseismic slips occur along subsegments of the western plate boundary and that a portion of the western segment may be locked. Furthermore, the he size of the earthquakes in the western segment - and thus the potential for tsunami generation - may be limited by other factors. Because of additional fracturing and segmentation of the western segment, earthquakes would be expected to have shorter ruptures and deeper focal depths. Effects of Sedimentation on Earthquake Rupture Velocity and Tsunami Generation. If the above-stated hypothesis of lubrication by sediments is correct, then the following explanation can be provided for the seismicity differences between the eastern and western segments of the MSZ and their potential for producing tsunamigenic earthquakes. In the eastern segment of MSZ, thrust earthquakes occur along the plate boundary where the sediments appear to be more consolidated, dewatered or lithified and thus, more likely to stick or lock before the stress is released by an earthquake. The earthquakes appear to be shallower in focal depth. Also, the consolidated sediments along the plate boundary would have a tendency to slow the rupture velocity of an earthquake. Additional, "en echelon", bookshelf type of sediment failure along an earthquake's rupture zone - would account for slower rupture velocity and for greater tsunamigenic efficiency. Such appears to have been the case in the Andaman Sea segment of the rupture of the December 26, 2004 earthquake along the Great Sunda Trench. The rupture velocity was much less in the Andaman Sea segment than in the Sumatra segment - which was not as heavily sedimented. Also, such slower rupture occurred along the Mid-America Trench when the September 2, 1992 Nicaragua tsunamigenic earthquake struck. It is believed that block motions of consolidated sediments were associated with bookshelf faulting which contributed to the slow, silent and deadly tsunami- earthquake. The block motions were extremely shallow and occurred within subducted sediments where there was a lot of shear - thus the rupture was slower in speed (Pararas-Carayannis, 1992). The same slower rupture occurred in the Andaman Sea segment of the Great Sunda Subduction Zone in December 2004. In both of these cases, the degree of sediment consolidation along the plate boundary appears to have been a key factor in locking slippage on the megathrust region of the tectonic boundary, then releasing greater energy when the stress thresholds were exceeded. The eastern segment of the MSZ appears to behave in a similar way. There is more sedimentation closer to the Indus and other major rivers in the east. The sediments are much thicker. The earthquake rupture velocities would be expected to be slower and the tsunamigenic efficiency would be expected to be greater because of potential bookshelf type of fault failures along the Makran coastal area. Furthermore, the existence of thrust earthquakes along the MSZ indicates that either the sediments along the plate boundary in the eastern segment become sufficiently well consolidated and dewatered at about 70 km from the deformation front, or that older, lithified rocks are also present within the forearc so that stick-slip sliding behavior along the subduction boundary becomes possible when the stress exceeds a critical level. Thus, a repeat of a great tsunamigenic earthquake like the 1945 event is very possible. Earthquake ruptures may be as long as 300 km long and moment magnitudes could be as much as 8. In contrast to the eastern segment, the plate boundary along the western segment of MSZ has not produced great earthquakes and there have been no recordings of shallow events. Most of the earthquakes along the western segment occur on the down going plate at intermediate, rather than shallow depths. This would suggest that dewatering and lithification of sediments occur at greater depth along the decollment surface of the plate boundary and, because of the greater focal depth, such earthquakes would not be as efficient tsunami generators as those along the eastern segment. Also, there appears to be much more fracturing along the western segment, which would suggest that future earthquakes may have shorter ruptures and lesser magnitudes. In spite of these observations, a large quantity of unconsolidated sediments does not necessarily mean a lower potential for great thrust earthquakes along a subduction boundary. It is rather the overall structural distribution of consolidated and unconsolidated sediments along the boundary that become the key factors. At the present time there is not sufficient data to evaluate better the effect of sediments on subduction dynamics in this region. The western segment of the MSZ could produce a great earthquake but more likely it could rupture as a number of segments in somewhat smaller-magnitude events. On the basis of the above evaluation, it can be concluded that the western segment of the MSZ is a potential source region of infrequent major earthquakes and potentially destructive local tsunamis. However, because of the shorter crustal ruptures, earthquakes on the western segment would not be as great as the 1945 event on the eastern segment. Maximum expected ruptures would be less than 100 km long and earhquake magnitudes would be up to 7. Based on the above discussion of earthquake data, geology morphotectonics and subduction processes, the following is a regional assessment of the tsunami generation potential in the Northern Arabian Sea, and the possible tsunami near and far- field effects elsewhere in the Indian Ocean. In addition to the source seismodynamics, a factor that could also contribute to the destructiveness of a tsunami generated in the Northern Arabian Sea would be the relatively large astronomical tide, which is about 3-3.5m (10-11 feet) along the Makran coastline. A tsunami arriving during high tide at a coast in the northern Arabian Sea could be expected to be significantly more destructive because of this high tidal range. Although the Makran Subduction Zone in the Northern Arabian Sea is an active seismic zone, large tsunamigenic earthquakes have been relatively rare. It is quite possible that tsunamis in this region have not properly reported or documented. A thorough analysis of historical records may reveal that many tsunamis occurred in the past. Such tsunamis could have affected Southern Pakistan, India, Iran, Oman, the Maldives and other countries bordering the Indian Ocean. Overall, the seismicity of the Makran region is relatively low compared to the neighboring regions, which have been devastated regularly by large earthquakes (Jacob and Quittmeyer, 1979). Although infrequent, major and great earthquakes have occurred along the MSZ throughout geologic history and in recent times. Several tsunamis must have been generated in the past along this active zone but have not been adequately documented. As already mentioned a large magnitude earthquake generated the oldest known tsunami in the region in 325 B.C. and not in 326 B.C. as reported in the literature (Pararas-Carayannis, 2006a). It is believed that the tsunami destroyed part of Alexander the Great's fleet while on its journey back to Mesopotamia after the India campaign (Lietzin 1974, Murty and Bapat, 1999, Pararas-Carayannis, 2006a). Large tsunamigenic earthquakes can be expected mainly on the eastern portion of the subduction zone. As previously described, the great earthquake (Mw 8.1) of November 28, 1945 on the MSZ generated a very destructive tsunami in the North Arabian Sea. According to the literature, the earthquake was a thrust event that ruptured approximately one-fifth of the entire length of the MSZ, which would be approximately 200 - 250 km. (Byrne et al. 1992). What was reported may be an underestimate. Although no centroid solution could be obtained for this event, the revised moment magnitude of Mw 8.1 would suggest a longer rupture - in the order of 300-350 Km (Pararas-Carayannis, 2006b). Nine other smaller earthquakes are known to have occurred in the eastern Makran with similar thrust mechanisms. The 1945 event's magnitude of 8.1 appears to be the upper limit of tsunamigenic earthquakes this region can produce along the plate boundary. The limiting factors appear to be an apparent segmentation of the MSZ and the large volumes and spatial distribution of both consolidated and unconsolidated sediments. The significance of the sediments to the subduction dynamics was discussed previously. In brief, tsunamis generated along the eastern segment of the MSZ can be expected to be destructive in Pakistan and other countries bordering the Northern Arabian Sea and the Indian Ocean. Along the western segment, the dynamics of subduction are different. Although aseismic subduction may be occurring, there are subsections which may be locked and have the potential to generate earthquakes with magnitudes up to 7 and local tsunamis along the Makran coast of Iran and Pakistan as well as along the north coast of Oman. The MAP region exhibits high internal deformation, layering and compaction of sediments (Fruehn et al., 1997). As reported previously, the 1945 Makran earthquake caused the eruption of a mud volcano a few miles off the Makran Coast. It was reported that a large volume of gas was emitted which caught fire and sent flames "hundreds of meters" into the sky. The observed flames probably resulted from emitted natural gas, which caught fire after the earthquake. This event and geologic studies of the MAP stratigraphy (Harms et al., 1984) indicate that the region has high petroleum deposits, including gases such as methane, ethane and traces of other hydrocarbons. The ocean floor of the continental margin along the MAP is thick with sediments in an oil producing area of the world. The unique geology, morphology of the sea floor and the thick sedimentary layers on the MAP region indicate that thick methane gas hydrate layers must exist in this region. Therefore, the explosion of gas hydrate deposits has the potential to generate tsunamis or to trigger submarine landslides that could generate tsunamis in the region. The Owen Fault Zone is a transform fault in the Arabian Sea that is associated with the active tectonic boundary of the India and Arabia plates. It extends from the Gulf of Aden in a northeast direction towards the Makran coast where it enters the coast in the Balochistan region. Then it continues as a land fault known as the Chaman Fault - an extensive system that extends in a north-northeast direction along Pakistan's western frontier with Afghanistan. The Chaman fault begins near Kalat, in the northern Makran Range, passes near the city of Quetta and continues to Kabul, Afghanistan. The Balochistan province in and around Quetta is the region of highest seismicity. On May 30, 1935, a great earthquake (Mw 8.1) along this fault destroyed the city of Quetta and killed about 30,000 people (Ramanathan and Mukherji, 1938). Up to the October 8, 2005 earthquake this had been the deadliest in Pakistan. Large earthquakes along the Owen Fault Zone or the Chaman closer to the Makran coastal range are infrequent, but have the potential of generating major earthquakes and tsunamis. Around Karachi and other parts of deltaic Indus, there are several thrust faults which have the potential of generating major earthquakes and local tsunamis. Unfortunately, most tsunamis in this region have not been adequately documented. A major thrust fault which runs along the southern coast of the Makran coast and parts of deltaic Indus is believed to be of the same character as the West Coast fault along the coast of Maharashtra, India. The Allah Bund is a major fault that traverses Shahbundar, Jah, Pakistan Steel Mills, and continues to the eastern parts of Karachi - ending near Cape Monz. This fault has produced many large earthquakes in the past in the deltaic areas along the coast, causing considerable destruction. For example, a major earthquake on this fault destroyed Bhanbhor in the 13th century. Another major earthquake in 1896 was responsible for extensive damage in Shahbundar. There is no record of whether any tsunamis were generated near the coastal regions. However, because of the proximity of this fault to sections of deltaic areas, it is possible that past earthquakes have generated landslides and local tsunamis. Another major fault near Karachi is an extension of the one that begins near Rann of the Kutch region of India. Still another one is the Pubb fault which ends into the Arabian Sea near the Makran coast. Finally, a major fault in the lower Dadu district, near Surajani, is also in the vicinity of Karachi. In brief, destructive local tsunamis can be generated near Karachi and the deltaic Indus area because of the proximity of thrust faults to coastal areas, the nature of crustal movements of major earthquakes, and the unstable, heavily-sedimented, coastal slopes of this deltaic region. Lateral transition between subduction and collision of the India and Arabia tectonic plates has formed the Kutch, Bombay, Cambay and Namacia Grabens, in northwestern India (Wadia, 1981). In the Kutch region, remote sensing and gravity investigations have determined a spatial pattern of tectonic lineaments along which 7 big earthquakes (M>6) occurred in the last 200 years (Srivastava and Ghosh, Indian Scool of Mines). Although infrequent, several destructive earthquakes in the coastal Sindh region occurred in 1524, 1668, 1819, 1901, 1956, and as recently as 25 January 2001 (Pararas-Carayannis, 2001). The larger earthquakes involved extensive vertical crustal uplift over land areas paralleling the orientation of the Kutch Graben. 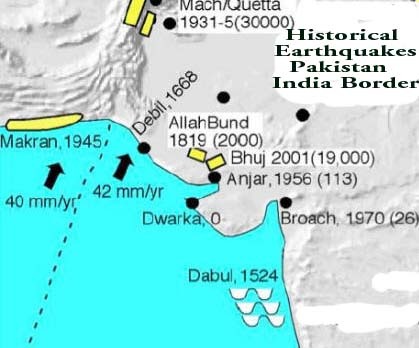 For example, the 1819 earthquake in Rann of the Kutch, bordering the Sindh region, was associated with thrust uplift of up to 30 feet along the Allah Bund fault and slippage depression of up to 10 feet along coastal fault plains. Although poorly documented as having generated a tsunami, the 1819 event was reported as having resulted in major sea inundation, destruction of coastal settlements, and permanent changes to the coastline and the drainage of major rivers, such as Indus. Probably the 1524 earthquake in the same region also resulted in major inundation by the sea. In conclusion, earthquakes associated with thrust and subsidence faulting in the coastal region of the Kutch Graben and along the major fault, which runs along the west coast of Maharashtra, India, have the potential of generating local tsunamis. Also, earthquake events on the Kutch Graben have the potential of triggering undersea landslides and local tsunamis in the offshore region. The tsunami hazard for this northwest region of India has been underestimated and needs to be properly evaluated. 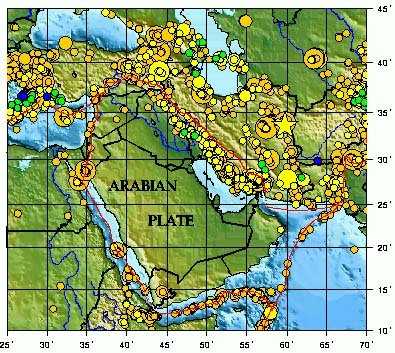 Active tectonic convergence of the India plate with the Arabian and Iranian microplates has created an extensive and complex tectonic plate margin in Southcentral Asia along the Makran coasts of Iran and Pakistan. The east-west oriented tectonic plate margin complex includes one of the largest accretionary wedges on earth. It is more than 900 km long, bounded to the east and west by large transform faults which define the plate boundaries. The present margin includes the Makran Subduction Zone (MSZ) and its associated topographic trench, the Makran Accretionary Prism (MAP), the Makran Coastal Range (MCR) and the Chegai Volcanic Arc. To the west of the MAP, continental collision has formed the Zagros fold and thrust belt. To the east, lateral transition between subduction and collision of the India and Arabia tectonic plates has formed the Kutch, Bombay, Cambay and Namacia Grabens, of northwestern India. Tsunamis generated in these regions of the Northern Arabian Sea can have a significant near and far field impacts. The MSZ is a relatively active and can produce destructive tsunamigenic earthquakes. Its seismic history indicates significant variations in rupture histories primarily in two segments. Large earthquakes occur mainly on the eastern segment. The earthquake of November 28, 1945 had a moment magnitude Mw 8.1 and a rupture estimated at about 300-350 km long. It generated a destructive tsunami. Waves of up to 13 m (40 feet struck Pakistan and waves as high as 11.5 m struck the Kutch region of India. Waves of 2 m struck as far south as Mumbai. Also Iran and Oman were struck. The magnitude of 8.1 of the 1945 event is the upper limit of earthquakes this region can produce along this plate boundary. The limiting factors are the apparent segmentation of the MSZ and the large volumes and spatial distribution of both consolidated and unconsolidated sediments. The degree of sediment consolidation along the plate boundary appears to be a key factor in locking slippage on the megatrhrust region, then releasing greater energy when the stress thresholds are exceeded. The sediments are thicker and the continental shelf wider along the eastern segment of the MSZ because of the proximity to the Indus and other major rivers. The existence of thrust earthquakes indicates that either the sediments along the plate boundary in the eastern segment become sufficiently well consolidated and dewatered at about 70 km from the deformation front, or that older, lithified rocks are present within the forearc so that stick-slip sliding behavior becomes possible when the stress exceeds a critical level. Thus, great tsunamigenic earthquakes with magnitudes up to Mw 8 and ruptures of 300-350 km can be expected to occur in the future. In contrast, the plate boundary along the western segment of the MSZ has not produced great earthquakes and there have been no recordings of shallow events. The present absence of earthquakes indicates either entirely aseismic subduction or those subsegments of the megathrust plate boundary are currently locked. It is more likely that both seismic and aseismic slippage is occurring. The extensive forearc and accretionary wedge seem to have a significant effect on the type of boundary slips that can be expected along or near the western segment - and thus on the frequency and intensity of potential tsunamigenic earthquakes in this region. Surveys of the area indicate that the mechanics of subduction processes near the deformation boundary on the western segment may be affected by the introduction of fine turbidite deposits which, perhaps, lubricate the decollment surface of the subduction boundary. Such deposition and lubrication could account for the aseismic slip and the sparse earthquake activity along sections of the western segment of the MSZ. Also, most of the earthquakes on this segment occur on the downgoing plate at intermediate, rather than shallow focal depths. This would suggest that dewatering and lithification of the sediments occur at greater depth along the decollment surface. Because of the greater focal depth, such earthquakes would not be as efficient tsunami generators as those along the eastern segment that have shallower focal depths The size of earthquakes - and thus their potential for tsunami generation - may be limited by other factors. There appears to be much more fracturing along the western segment of the MSZ. Earthquakes would be expected to be smaller-magnitude events (less than 7) and to have shorter ruptures (less than 100 km) along subsegments. In spite of these observations, a large quantity of unconsolidated sediments does not necessarily mean a lower potential for great thrust tsunamigenic earthquakes along a subduction boundary. It is rather the overall structural distribution of consolidated and unconsolidated sediments along the boundary that become the key factors. At the present time there is not sufficient data or surveys to fully evaluate the effect of sediments on the subduction dynamics of this region. On the basis of the above evaluation, it can be concluded that the western segment of the MSZ is a potential source region of infrequent major earthquakes and of potentially destructive local tsunamis. The MAP region is another potential source of local tsunamis. Its unique geology, morphology of the sea floor, thick sedimentary layers and its proximity to vast sources of oil and natural gas deposits indicate the presence of thick methane gas hydrate layers. Explosion of gas hydrate deposits has the potential to trigger submarine landslides that could generate local tsunamis. Another potential source for tsunamis in the North Arabian Sea is near Karachi and the deltaic Indus. Local tsunamis would be generated because of the proximity of thrust faults to coastal areas, the nature of crustal movements of major earthquakes, and the unstable, heavily-sedimented, coastal slopes of this deltaic region. Finally, the Kutch Graben region of India has produced several large earthquakes in the past and there is a record of extensive "sea flooding" associated with the 1819 earthquake. Thus, earthquakes associated with thrust and subsidence faulting in the coastal region of the Kutch Graben or along a major fault - which runs along the west coast of Maharashtra - have the potential of causing tsunamis directly or by triggering undersea landslides. Similarly further south, thrust and subsidence faults on the Bombay, Cambay and Namacia Grabens, have the potential to generate local tsunamis, particularly from landslides triggered by major earthquakes. Dorostian A., Gheitanchi M. R., Seismicity of Makran. Report of College of Science, & Institute of Geophysics, Islamic Azad Univ. North Tehran Branch, Iran (undated). Murty. T. and A. Bapat, 1999 "Tsunamis on the coastlines of India", International Tsunami Symposium, May 1999 (Abstract). Pararas-Carayannis, G. 2006a. Alexander the Great - Impact of the 325 B.C, Tsunami in the North Arabian Sea Upon his Fleet. Quittmeyer, R.C., and Jacob, K.H., 1979. "Historical and Modern Seismicity of Pakistan, Afghanistan, N.W. India and S.E. Iran," Bulletin of the Seismological Society of America, 69/3, pp. 773-823, 1979. Ramanathan, K., and Mukherji, S., 1938, "A seismological study of the Baluchistan, Quetta, earthquake of May 31, 1935", Records of the Geological Survey of India, Vol. 73, p. 483 - 513. Schoeppel, R.J., 1977. Prospects of Geothermal power in Saindak area, Baluchistan province, Pakistan. Final report for Oil and Gas Development Co. 15p. Wadia, D.N., 1981, "Geology of India", Tata-McGraw-Hill, New Delhi.